Ian Duckworth’s new book was spawned from a passion about helping those suffering from mental illness. ‘Ducky’ wrote ‘Barwon Grove, the River the Sea, it’s in our Soul’ because he was alarmed at the rate of youth suicide. “Hopefully it’s a way of bringing the spotlight onto youth suicide,” the Ocean Grove local says. The book is a scrapbook of everything Ocean Grove and Barwon Heads. It’s 120 pages of surfing history with general history of Ocean Grove and Barwon Heads with a huge spread of old and new photos. “Ocean Grove and Barwon Heads has become a hot spot for suicide, not only for youths, but for all age groups,” Ian says. “In the back of the book there’s a brutal testimony from a lady who lost her son David to suicide. The book also contains poetry about mental illness. It’s a superbly put together publication with many locals contributing photographs and words. Ian has written two other books in support of Beyond Blue – ‘Ocean Grove Surfing in the 60s’ and ‘Poems of the Point’. 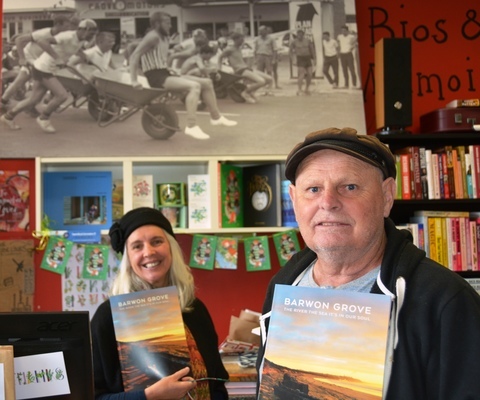 ‘Barwon Grove, the River the Sea, it’s in our Soul’ is available from Bookgrove in Ocean Grove and all profits will go to Beyond Blue. There are many organisations that help people who might be feeling depressed or anxious. Beyond Blue (1300 224 636, beyondblue.org.au), Lifeline (131 114, lifeline.org.au), Black Dog Institute (blackdoginstitute.org.au) and suicide call back service (1300 659 467) are some.